Friday ALL You can EAT Fish Fry time is Back! Greater Grand Rapids area 2017! **Please note there will be NO Fish Fry on Good Friday. baked potato or fries, coleslaw, roll, drink and ice cream. Mac & cheese for children. Take-out available. Dinners are available dine in, take out and new this year drive thru. Fridays (February 24, March 3, March 10, March 17 and March 24) — 4:30 p.m. to 7:00 p.m.
Friday, March 3. We will be serving from 4:30-7:00pm in the Parish Center Cafeteria. Our menu includes: Baked or fried walleye, baked potato or french fries, cole slaw, mac & cheese (eat in ONLY), sourdough roll, and drink. Grilled cheese sandwiches available for non-fish eaters. Desserts are available for a donation. New this year: We are able to accept all major credit cards for your meals. Cost: $10.00 Adults, $8.00 Seniors, $4.00 Children under 12, Children under 3 are free. clam chowder; mac & cheese; cheese pizza. Kids (age 6-13) $5.00; Under 6 FREE; Family Plan $25.00. Help is always needed; feel free to come and lend a hand. 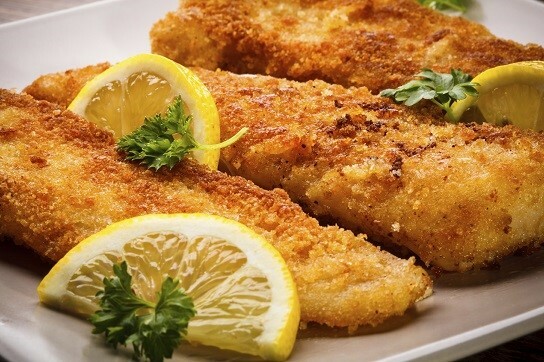 Fried or Baked Fish with French Fries or Baked Potato, Coleslaw, Roll, Beverage & Dessert. Sorry to tell you that you have the wrong St. John Vianney info for the fish fries. You have a St. John Vianney from Mentor, Ohio listed instead of our local one here in Wyoming, MI. St. Alphonsus has a GREAT Walleye fry, however……. We arrived there at 6:13pm this evening, (3/31/2017), and there was an excess of 175 people in a VERY long line that did not move much. so we left. My wife and I used to go there a lot 20 years ago, but I guess the secret is out. American Legion 179 has a good fry, but Pollock not Walleye.